I’ve been learning MATLAB lately and playing with the Arduino more and more, then I started to wonder how to make the Arduino communicate with this program, it turns out it’s not hard at all. See the code below. It will send the value of a variable from the Arduino to MATLAB and plot them. If you have used the Serial class of the Arduino before this won’t be new to you. Simply print some data with the Serial.print() function. For those who haven’t used the serial class before all am doing in the code above is sending the value of the variable i at a baud rate of 9600. This is just as easy the Arduino. First we want to create an object of the class serial. Set the port to the port you are using to program the Arduino, am using COM4 to program it. Next set the baud rate you set in the Arduino code above. Now we need to open the arduino as if it were a file. To read data from the Arduino we use the fscanf function, these will be our y-axis values on the plot. The %d means we are receiving a decimal number. Now we close the Arduino communication and plot the data. This is the exact code I used. If everything worked you should get the following plot. Let us know how you are planning to use MATLAB and Arduino in the comments below. 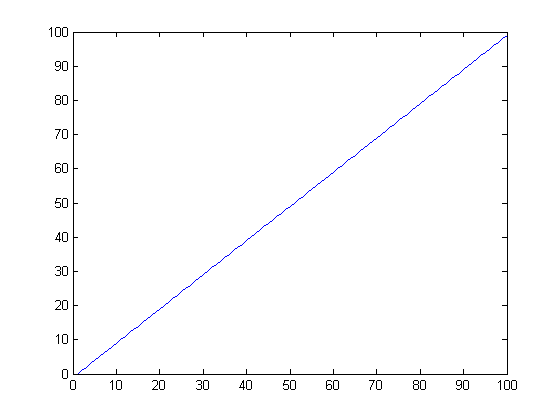 the plot generated by MATLAB using the variable i from the Arduino.